This walkthrough may not be sold and may not be used for any commercial purposes. Neither is it permitted to publish this walkthrough in any way without the written permission of the author. Feel free to place this walkthrough on your web site or on your home page, on condition that no part of this walkthrough is changed and that the name of the author (Bert Jamin), the URL of the authors home page ( www.gamesover.com ) and his E-mail address ( gamesover@planet.nl ) are mentioned unchanged. For the most up to date walkthroughs always visit www.gamesover.com. All images are property of Cryo. After your Savior, the Targui has left, you decide to take a look around a little bit. You can go only one way. So go that way. Walk forwards and than go to the left. Go forwards two times. You are now facing a guard. You can try to speak to him but be careful it's a very unkind type with very loose hands... You can go to the left. But that path leads to a dead-end street up in the mountains. Turn to the right and you'll see a path leading up with a small bush. Go into that direction. Turn to the left and go forward one more time. Another guard is attacking you. Thank goodness you'll be saved once more by this unknown person. Walk towards the bent rock formation. 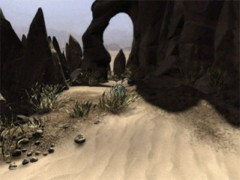 While you are going through this rock formation, you'll see some kind of cables on the ground coming from the right. Turn to the right and enter the cave. Walk towards the circular hell lightened membrane. 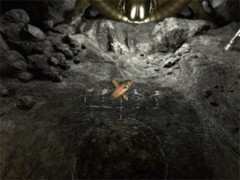 It leads to another part of the cave, but is still closed. Your goal is to open this membrane. Look to your right and you'll see all kind of technical equipment. You can't do anything with it, so leave it alone. Standing in front of the membrane, look down. On the ground you'll see a circle and above it five different signs. Take your disk from your inventory and place it at the center of the circle. Now take your stick and place it on the disk. You just made yourself a gyroscope. By placing this gyroscope in the correct on the signs you'll open the membrane. Number the signs from the left to the right as number 1, 2, 3, 4 and 5. Place the gyroscope in this order on the signs: 2, 5, 3, 1, 4. I have the idea that this combination can be different in some games. If the last one didn't open the membrane, just try this one: 4, 1, 3, 5 and 2. If neither one of these combinations does the trick, you'll have to try out another one yourself. Every time you place the gyroscope on the correct sign, it will spin across the circle leaving behind a star at the rim of the circle. After having done all five of them, the membrane opens, revealing the next part of the cave, which seems to be some kind of temple. Enter the membrane. Walk towards the wall at the right side of the sarcophagus. You'll see a mural of two Egyptian guys with an image of a star and beneath that star you'll see curved line with markings to the left and to the right. From the top to the bottom you'll see one marking to the left, two markings to the right, one to the left and another one to the right. Remember or write down this code... You are going to need it in a few seconds. 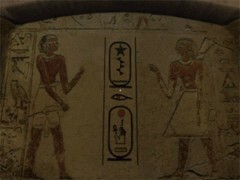 Walk towards the symbol on the wall at the left of the sarcophagus. You can push the left and the right side of the star. 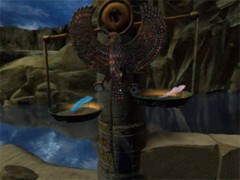 By pushing both sides in the correct order, the sarcophagus opens. The code is the one you just saw on the mural on the other wall and is: 1 x left, 2 x right, 1 x left and 1 x right. Look what's coming out of the sarcophagus. It's nothing less then a personal Psychopomp! It's your personal help and companion for the next part of the game. Although... helper!? He won't be of very much of a help to you. The most important things is that he knows how to steer the air ship. You can ask him about anything you like. Walk to the stairs leading up. If you don't know where to find these stairs, I suggest you better quit the game right now:-) Of course you might think that you simply can climb up these stairs. Just try and you'll see that this isn't the case... Take your wooden bird from your inventory and use it on the stairs. You'll be transported to a higher part of the pyramid. When you're standing outside walk to the air ship. Talk to the Psychopomp and ask him about everything you can. Hop on board of the air ship. 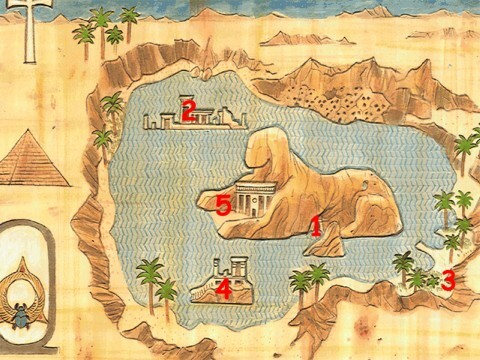 The first place you're visiting is the island with the temple of the high priest. Walk back to your vessel and speak to the Psychopomp. Ask him about everything you can. Now choose your map from your inventory. On the image below you'll find the most efficient order in which you should pay a visit to the several locations. First of all go to 1. Walk towards the altar. Open the small box. You'll find an Ankh cross, the symbol of life. After that go to 2. Here you'll find another priest. She tells you that you have put together an old story. This sounds pretty easy but it isn't! Walk towards the wall at the right behind this priest. You'll see a wall existing of 12 different tiles and beneath very tile you'll see a small strip with some ancient inscription. Your goal is to make a logical story by placing the strips into the correct sequence. After that you have to place each and every tile into the correct position, corresponding with the sentence of the strip. So remember... first you have to place the strips into the correct order and after that you'll have to do the tiles. If you are doing this in the reverse order, it won't work!!! Strip 1: Osiris son of the Earth and Sky, is Pharaoh and Isis, his sister, is Pharaoh's wife, she brings knowledge to Egypt. Strip 2: Seth, twin to Osiris, is jealous of his brother and plans his murder. Strip 3: During a feast, Seth offers a splendid coffer to anyone who fits perfectly inside it. Strip 4: All the Guests try the coffer, but only Osiris can lie down inside it. Strip 5: Before Osiris can leave the coffer, it is shut fast by Seth's servants and thrown into the Nile. Strip 6: Isis seeks her lost husband. At Byblos, she sees the coffer caught in the branches of a tree. Strip 7: She hides Osiris in a swamp, but Seth learns of her actions and determines to discover his brother's whereabouts. Strip 8: He finds him and cuts him into 14 pieces, which he hides throughout Egypt. Strip 9: The faithful wife succeeds in recovering 13 of the pieces. Strip 10: She puts the body back together and prepares it with oils and perfumes. Then she wraps it in bandages. He appears almost reborn! When you received the talisman, use your map to go to 3, the beach. On the beach turn to the right and go forward one time. Turn to the right and walk to the boy that's fishing with a net at the end of the beach. Talk to him and you'll learn that doesn't catch a single fish. Offer him your talisman. After that he catches loads of fish. And not only that, he also catches some kind of small scale. Take it from his net. When he asks you if you want your talisman back, you refuse it of course. Why should you take it back? You only had to solve this minor puzzle with the strips and the tiles, right!? In exchange he gives you a stone icon. Use your map to go to 4. Climb up the stairs and walk towards the sarcophagus. Use the stone icon to open it. Pick up all the colored feathers. Turn to the left and you'll discover some kind of pin sticking out the pillar at the left. Place your scale on this pin. Your goal is to find the heaviest feather. You have ten feathers and one of them is heavier than the others. I can't tell which one is heavier than the rest because this differs from game to game. Simply use the scale to find out which one is the heaviest one of all. One tip: once you found out that one of the feathers isn't heavier than another feather, you can count that one out. 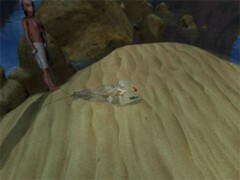 After you found the heaviest one, put back all the other feathers into the sarcophagus. Be sure to keep the correct feather in your inventory! 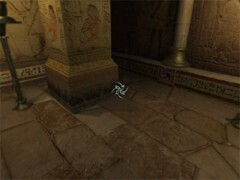 For the last time use your map to go back to 1, the cave where you found the Ankh cross on the altar. Walk to the box on the altar. When you're standing in front of the altar, get the mysterious box from your inventory and open it. You'll be teleported to the cave where it all started.